Data base communication is communication between different software. We might have data in Microsoft word or Microsoft Excel or other software and we need access for our program then this function of PLC helps us to communicate with them. We take example of Microsoft Excel. First we should open Microsoft excel then go to Excel Menu and select Excel option formula. Tick on working of formula R1C1 reference style. Here we save our file with name ‘g’ at any place you want. DDE ( Fill the DDE which allow excel user to change in data in PLC. Take text display from menu and give its Tag name ‘a’ and select its type I/O real. Here we run our scada program. When we change the value in Display, Same data pasted in Excel in Row first, column first. Same happens when we change in R1C1 of Excel, the data also changes in display of Scada. 1. User can access data from any file. 2. Programmer can control multiple programs by single frame. 3. A simple user (Not a PLC programmer) can control the full system with their best command software like Microsoft Office. Note: There are different extension names for different software as already taken by manufacturer company. There are some words that are used in machine control systems that have special meanings. For safety purposes, the use of these words is explicit and can have no other meaning. They are generally used when naming control circuits, labeling switch positions on control panels, and describing modes of operation of the machine. List of some of the more important of these terms are given below. This is a machine state in which power is applied to the machine and to the machine control circuits. The machine is ready to RUN. This is also sometimes call the STANDBY state. Electrically, the opposite of ON. Power is removed from the machine and the machine control circuits. In this condition, pressing any switches on the control panel should have no effect. A state in which the machine is cycling or performing the task for which it is designed. This state can only be started by pressing RUN switches. Don’t confuse this state with the ON state. It is possible for a machine to be ON but not RUNNING. The state in which the machine is ON but not RUNNING. If the machine is RUNNING, pressing the STOP switch will cause RUNNING to cease. 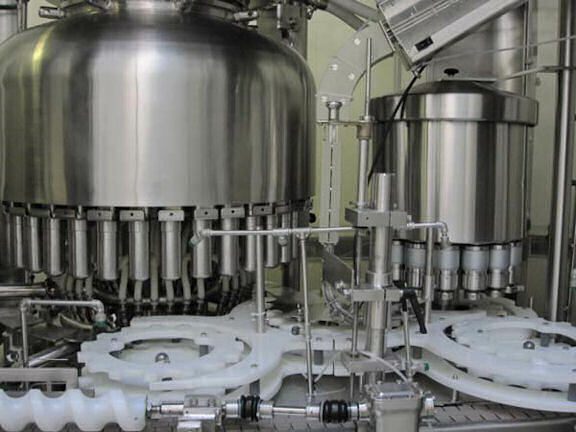 A condition in which the machine can be “nudged” a small amount to allow for the accurate positioning of raw material while the operator is holding the material. The machine controls must be designed so that the machine cannot automatically go from the JOG condition to the RUN condition while the operator is holding the raw material. A mode of operation in which the machine RUNs for one complete operation and then automatically STOPs. Holding down the CYCLE button will not cause the machine to RUN more than one cycle. In order to have the machine execute another CYCLE, the CYCLE button must be released and pressed again. This mode is sometimes called SINGLE CYCLE. A control design method in which a machine will not RUN or CYCLE unless two separate buttons are simultaneously pressed. This is used on machines where it is dangerous to hand-feed the machine while it is cycling. The two buttons are positioned apart so that they both cannot be pressed by one arm (e.g., a hand and elbow). Both buttons must be released and pressed again to have the machine start another cycle. A plc executes an initialization step when placed in run mode then repeatedly executes scan cycle sequence. Basic PLC has three steps. During this process data is taken from all input modules in system and placed into an area of PLC memory referred to as input image area. In this scan, input terminals are read and the input image area is updated accordingly. During program scan, Data in input image area is applied to user program, the user program is executed and output image area is updated. During the output scan, data is taken from the output image area and sent to all output modules in the system. In this scan data associated with output image area is transferred to output terminals. We should understand that input, program, and output scans are separate and independent functions. Any changes in status of input devices during the program or output scan are not recognized until the next input. Program (Ladder logic) scanning typically takes place left to right across each rung and from the top to bottom rungs, in order known as rung scanning. This method used in plc like Allen Bradley. Another method used by Modicon/Schneider Automation is known as column scanning. In this processor looks at first contact at Top left corner and reads the first column from top to bottom. Next reads the second column from top to bottom and so on. We use rung or column method according to PLC we use. Siemens SCADA System becomes the answer of the Industrial tighter and greater challenge by the days. Almost every manufacture, developer and the console maker was go in challenge to pursue the perfection that was set in not only the idea of great production process to grow up and increase the productivity but also comes to deal with any aspect that can bring the safety and effectiveness in case of whole business process. Siemens SCADA System inline with the market standard requirements, sales objectiveness and more with the crystal clear managerial decision maker was become the reality inside the industries. And so with the “value up and cost down” stigma that grow up through the business owner or industrial manager. By that reason, the scale of better system, solution and support developer dramatically day by the day. And so with the Supervisory and Control system that can control the whole business process and shown better data output was needed more and more. 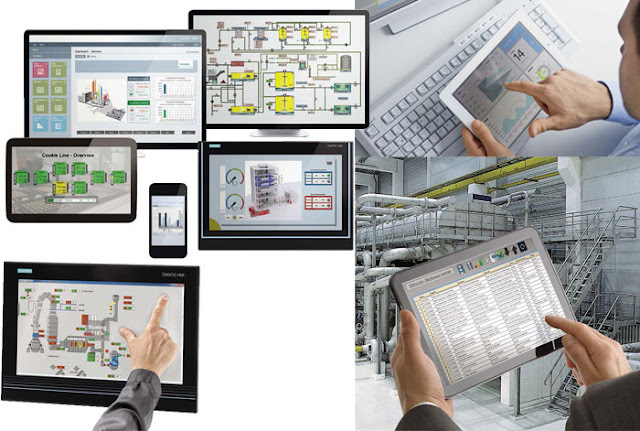 SIMATIC WinCC was developed by Siemens SCADA System to answer the challenge of industries and industrial partners as scalable and open SCADA system. It called the requirements of the future as the solution for the data Supervisory Control of modern industrial plants that continuously growing, and increasing by the day. As key to increased productivity, SIMATIC WinCC combines efficient engineering with powerful archiving and maximum data security.It serves as the basis for efficient operations control and intelligent production analysis. This product offer stationary or mobile solutions for increasing requirements. For this purpose, the SIMATIC WinCC use Siemens SCADA System that totally know-how of more than 15 years across all sectors. No matter how moderate or expansive the client or end users requests – it provide the suitable solution. Benefit from information provision anytime and anywhere with mobile SCADA solutions –also with available tablet or smartphone hardware. The application of multi touch gestures in industrial environments opens the door to modern operating concepts. International standards as well as native script and programming interfaces, also special requests can be easily realized. This Siemens SCADA System has easy scalability and efficient production analysis for any field of industries, such as: Automotive production and suppliers, chemical and pharmaceutical industry,food, beverages and tobacco industry,machine and plant engineering,energy supply and distribution,trade and service sector, plastic and rubber industry,metal processing and steel industry,paper production and processing, printing industry, transport, traffic and logistics,water treatment and wastewater purification,building services management and management of properties. Siemens SCADA Systems was developed several types of SCADA Systems named SIMATIC WinCC that can be used and choose for any field and industrial aspect to increase the level of productivity inside the whole industrial, manufacture and business process as well as the solution and better IT’s technology applied.Siemens SCADA System as one of popular platform that are known and recognized by the Industries has been developed by many console developer and manufacture around the world. One of great named was Siemens SCADA System with SIMATIC WinCC that offered “scalable and open SCADA system for maximum plant transparency and productivity”. Industrial automation is a phrase we often hear, when reducing labor cost and increasing production volume are the goals of all manufacturing companies. But what do we mean by automation? An industrial manufacturing setup involves different processes which have to be controlled as per a particular sequence, and need to be monitored 24/7.These operations can either be done by deploying manpower or can be automated by employing control systems, information technologies, machines, and automation devices like PLC and SCADA. These automation devices can be used for controlling Variable frequency Drives (VFDs), industrial processes, machinery and factory assembly lines. Replacement of human interference and operator may result in substantial cost reduction in the long run, can lead to a steady and fast rate of production, may be good substitutes for humans in hazardous conditions, and more apt for monotonous human work. PLC and SCADA – What are they? A PLC or a Programmable Logic Controller is a microprocessor into which a program is fed so that it can control several functions in industrial processes. The functionality of the PLC has evolved over the years to include sequential relay control, motion control, process control, distributed control systems and networking. They were initially invented to replace the electromagnetic relays and the cumbersome wirings in a control circuit. The data handling, storage, processing power and communication capabilities of some modern PLCs are approximately equivalent to desktop computers. The logic or sequence of operation for a process is executed as per a control logic program or software. But it differs in some ways from a computer. Unlike desktop computers, PLCs have multiple inputs and outputs, and are designed for the rugged operation under extreme industrial conditions. They operate under extended temperature ranges, have immunity to electrical noise, and have resistance to vibration and impact. CPU: CPU or the Central Processing Unit is the heart of the PLC system. It executes the control instructions of the control logic program. The CPU reads input data from various sensing devices, executes the user program from memory and sends appropriate output commands to control devices. Input modules: These are used for interfacing between input devices (such as start and stop push buttons, sensors, limited switch, selector switch) and microprocessor. The input devices which are in the field or remote locations are hard-wired to terminals on the input modules. Output devices which are located in the field or remote locations such as small motor, motor starters, solenoid valve, and indicator lights are hard wired to the output modules. The output interface modules convert the controller or processor signals into external signals which are used to control the output devices. Power Supply Module: This module provides the direct current (DC) power source required to produce low-level voltage used by processor and I/O modules. Programming device: This is a device, which is usually a personal computer, used to enter instructions or software program into the PLC. In an industrial scenario, routine supervision of machinery and industrial processes can be an excruciatingly tiresome job. A 24×7 supervision of assembly line equipment, checking their temperature levels, water levels, oil level and performing other checks need lot of time, manpower, and investment. So in the era of automation, engineers have devised the SCADA or Supervisory Control and Data Acquisition system which consist of equipments and sensors that monitor the field equipment from one central location and involve less human intervention for routine checks. The SCADA systems perform data collection and control at the supervisory level. Some systems are called SCADA though they only perform data acquisition and do not control equipment. SCADA is basically a software tool which helps you to view, monitor, control your process variable data and provides a graphical representation of your plant and processes on a front end display before the operator stationed in a control room. SCADA Master Station Computer Systems: It is the repository of the real-time or near real-time reported data collected from the remote terminal units connected to it. The back end SCADA software must be able to collect data values from the RTUs, should have software for their retrieval, storage and processing. The processing may include unit conversion, cataloging into tables etc. Human-Machine Interface (HMI): The values and data collected and stored are presented to the human operator in the form of understandable and comprehensible HMIs. This includes easy-to-understand screen layouts, pictorial representation, detailed schematics, and animations representing the running states and health of the field equipment and machines. 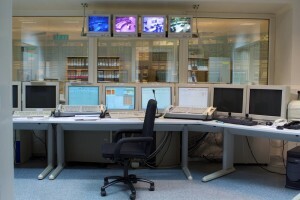 In the past, Supervisory Control and Data Acquisition (SCADA) functions were primarily performed by dedicated computer-based SCADA systems. Whereas these systems still do exist and are widely used in industry, the SCADA functions can increasingly be performed by TCP/IP/Ethernet-based systems. The advantage of the latter approach is that the system is open; hence hardware and software components from various vendors can be seamlessly and easily integrated to perform control and data acquisition functions. However, stand-alone SCADA systems are still being marketed. Thus as PLCs and SCADA systems continue to be lucrative automation devices, several companies like Allen Bradley, Delta, Siemens, and Schneider have their own set of PLC, SCADA, HMI products and their own proprietary software programming language. Implementing flow control in centrifugal pumps and fans by means of variable speed AC drive instead of the traditional mechanical flow control devices is capable of providing energy savings from 10% to 60% depending on the application. This typically provides a return on investment (ROI) of 6 to 24 months, depending on the process load and if this is a new design or a retrofitting of existing installation. and elimination of valves as sources of fugitive emissions. Egypt is experiencing one of its most series energy crises for decades, the rising population and the intense heat waves lead to electricity demand around 20% more than the available generation capacity. This is calling for innovative -industry proven- solutions to enhance energy efficiency that would lead to reduction of the overall demand as well as reduction of CO2 emissions and carbon foot-print. This paper discusses the use of variable speed AC drives with pumps and fans for flow control applications instead of a control valve or louver, and how this can help in achieving high levels of energy savings, increase equipment life-time and allow for safer and more environment friendly operation. Controlling the flow of centrifugal pumps and fans is traditionally achieved by means of mechanical flow control devices (i.e. control valves and louvers). Although such technique has been the standard of all process control text books over the years, they fail short in providing any significant reduction in energy consumption in response to a reduced process demand, figure 1 illustrates the relation between power consumption against a varying flow rate by means of a control valve. As illustrated in figure 1, reducing the flow by 20% by means of control valves or louvers will have minimal or no impact on the rotating equipment energy consumption. This lack of direct relation between product flow rate and its energy consumption contributes directly to the increase of per-unit production cost, and the increase of plant’s carbon foot-print. Another drawback for the use of such traditional method of flow control is an increase of operating pressure of the rotating equipment, which is a major contributor to frequent leaks, increased vibration and motors overheating. Figure 2 explains the relation between valve control and operating pressure. The above mentioned factors have a direct impact in increasing the plant operation and maintenance costs as well as increasing the unplanned maintenance activities. Variable frequency drives (VFD) are becoming more common place and more widely used in applications. They are capable of varying the output speed of a motor without the need for mechanical pulleys, thus reducing the number of mechanical components and overall maintenance. But the biggest advantage that a VFD has is the ability to save the user money through its inheriting nature to save energy by consuming only the power that’s needed. Applying the affinity low to the power consumption curve of centrifugal pump or fan shows the amount of energy that can be saved at the same operating point of the throttling valve approach; figure 5 shows energy saving of almost 50% in response to a 20% reduction in flow rate. When looking at the VFD control from the pump/system curves point of view, it shows the additional benefits of reduced operating pressure at the same flow rates, and thus reduced vibrations, leakage potential and mechanical failures. The main limitation in flow control using VFD/pump combination is presented in processes where very wide range of flow rates is required to be achievable, for example a range from 20% to 100% of nominal flow rate. Operating the pump at very low speeds will result in very low produced pump head, this head may not be enough to overcome the static system head, and so flow may never build-up. The solution for the above limitation, a combination of VFD and a control valve can be utilized, with a split range control algorithm, so the VFD regulates the high flow rates down to a certain minimum, and when the process demands lower flow-rates, the control valve starts adjusting the system curve to achieve the requested lower flow rate. If the energy savings were small, then this would be an irrelevant point. However, there are so many liquid flow pumps in processes that pump up to a high head, only to take that energy loss as pressure drop across a control valve, that this source of energy loss may be as much as 60% of the pump energy and up to 25% of the total energy used to operate a refinery, paper mill or chemical plant. Then too, if we designed our processes from the beginning with the VFD/pump, we could use much smaller electric drive motors. It is well known that the most often cited problem in tuning of PID control loops is the variable hysteresis introduced into the flow loop by control valve stickiness. The control valve also introduces a lag due to mechanical motion of the valve actuator itself. Control loops that have been optimally tuned at plant startup must gradually be detuned as the stickiness of the control valve builds, or the loop may become unstable. Today, we seem to accept this kind of sub-optimal process performance, but we can do better by replacement of the major source of error—the control valve—with a VFD/pump. From one hand, removing “or neutralizing” the control valve, which is a component with a high demand on maintenance resources is a great source of cost reduction. On the other hand, operating the pumps at lower pressure levels increases the life time of the pump itself, reducing stresses and vibrations on all mechanical components of the system and reduces possibilities of leakage as well. The benefit obtained from the elimination of fugitive emissions known to originate at the packing of the control valve stem is obvious when the control valve is eliminated. A less obvious benefit of using a VFD rather than discrete motor starters is operation at a near-unity power factor. Many plants use expensive capacitor banks to enhance their overall power factor, these capacitor banks also require regular maintenance and replacement. 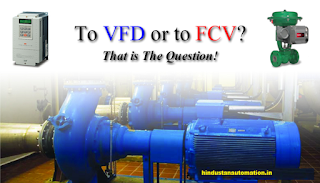 Thus, the use of VFDs eliminates the need of most of plant’s capacitor banks. It seems clear that using a VFD/pump combination to replace the use of an AC line-powered electric motor and a control valve is a superior way to do flow control and reap large benefits in lower energy consumption with better energy efficiency. There is also the potential for improved process control from elimination of the problems of control valves.